A strange week. I think I struggled to get back into a disciplined habit after 12 days without walking, planning, booking ahead, writing my blog, finding meals and charging phones. I also found I was quite lonely this week and I think I might have talked the ears off Fran and Sam during my stay with them. A week of 2 halves. 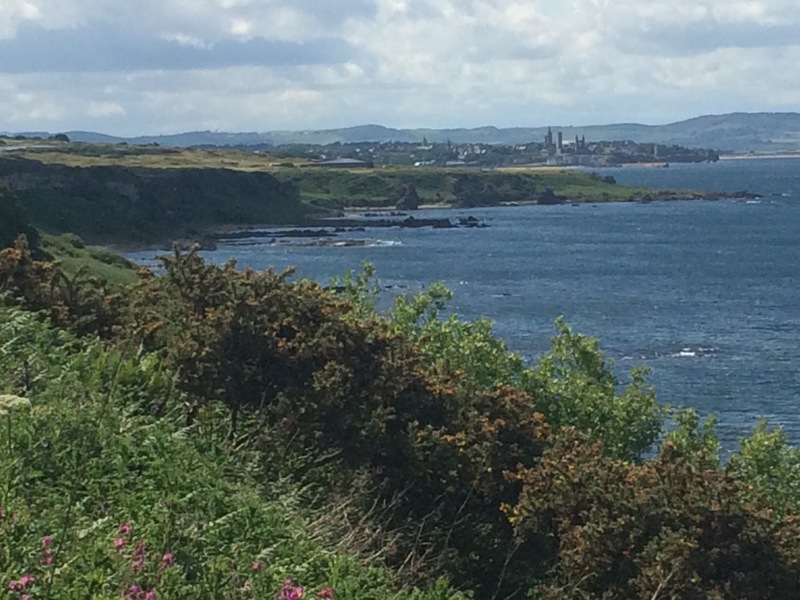 Walking through Fife was really nice: a well-marked coastal path, beautiful scenery, wildlife, people and picturesque little coastal towns. Crossing the Tay Bridge seemed to send me to the opposite: an absence of footpaths, drab towns with few people and sometimes little to see. 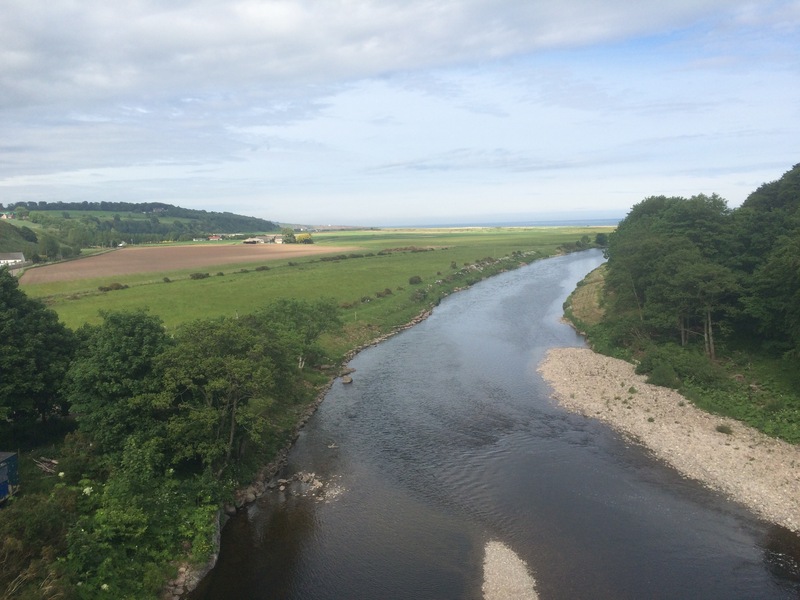 I think the grey weather didn’t help and, talking to Fran, I know that Angus is a beautiful part of the country and my visit was marred by some boring walking on cyclepaths, drab weather and poor choice of cafes. 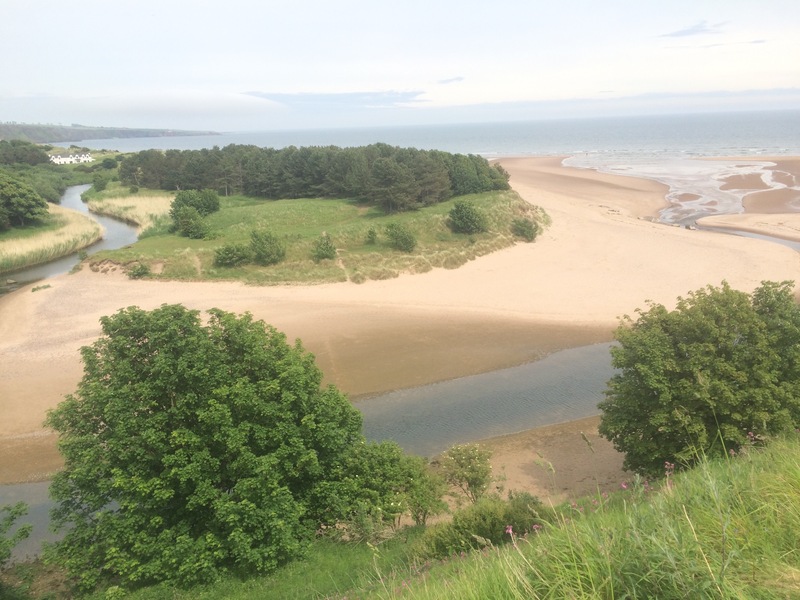 I shall hope for a better experience next time because Lunan Bay and Seaton Cliffs are worth a visit. Maybe I should have tried the Arbroath smokies? A big thank you to Ruth for allowing me to use his house for the week, and also to Sam and Fran for hosting me for 2 nights. It has been very convenient in so many ways to have a base to go back to for several nights; however, I think that after 3 weeks with 3 bases I am ready to get back to a more nomadic lifestyle. I have noticed that, whilst harder and less convenient, moving on every day does feel more like I am moving forward in my journey. I guess there’s always a trade-off! I got up late with no plans for where I was heading, 5 days of blog still to catch up on and it was raining. Perfect day to overstay my welcome with Fran and Sam and enjoy an unplanned rest day to try and catch up. 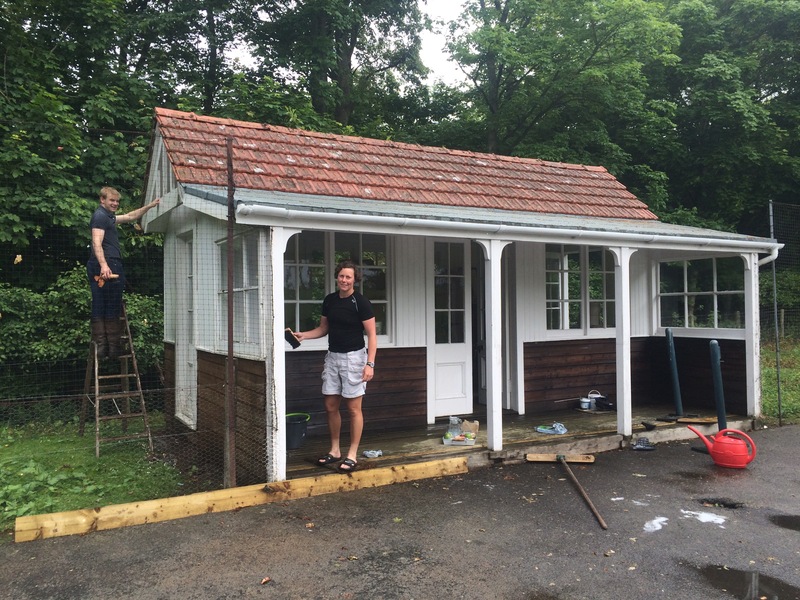 Once I’d got up to date with my blog I helped Fran and Sam wash the summerhouse, which was actually rather relaxing. I have enjoyed their company. The sharp rain showers made me glad I wasn’t walking; however, the weather warnings for thunderstorms didn’t materialise. I left Ruth’s house for the final time and caught a bus and then train to Arbroath. I reckon I got a better view of the coast from the train than I did walking yesterday. Arbroath seemed deserted as I followed the signs to “fit o’ the toon” (the foot of the town) and found myself in the small harbour. 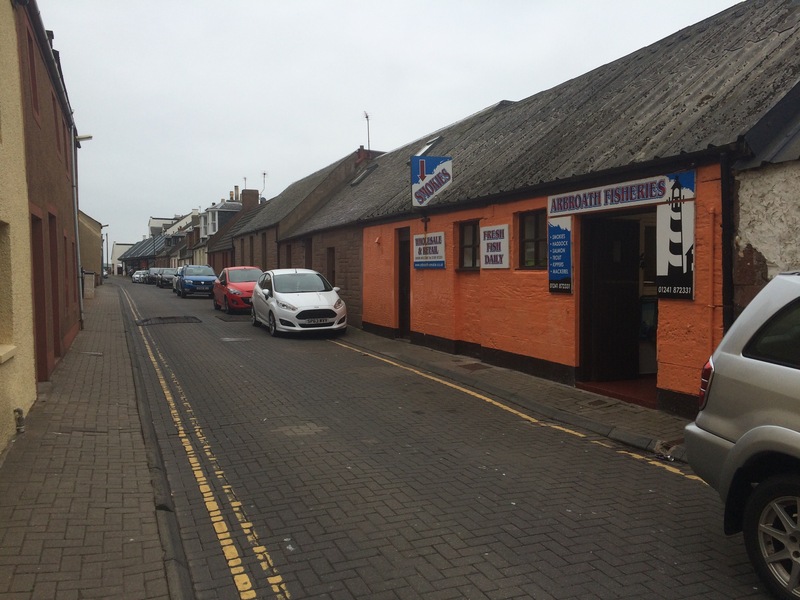 I could have stopped at any number of half a dozen small shops selling Arbroath smokies, most of which seemed to be somebody’s front room. 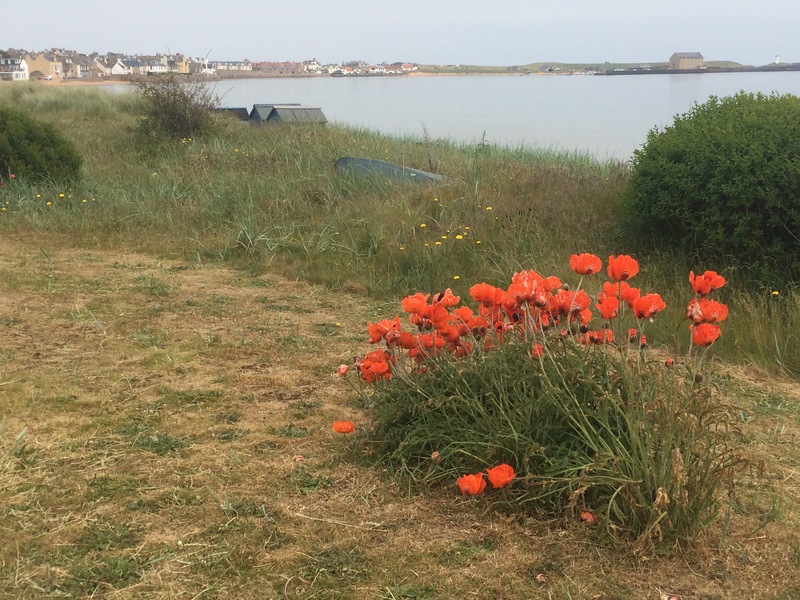 I walked down the streets of small terraced houses, out into Victoria Park and then up onto Seaton Cliffs. It was a gloomy day, just grey, no clouds, everything grey – the sky, the houses, the sea, and this was turning my mood grey! 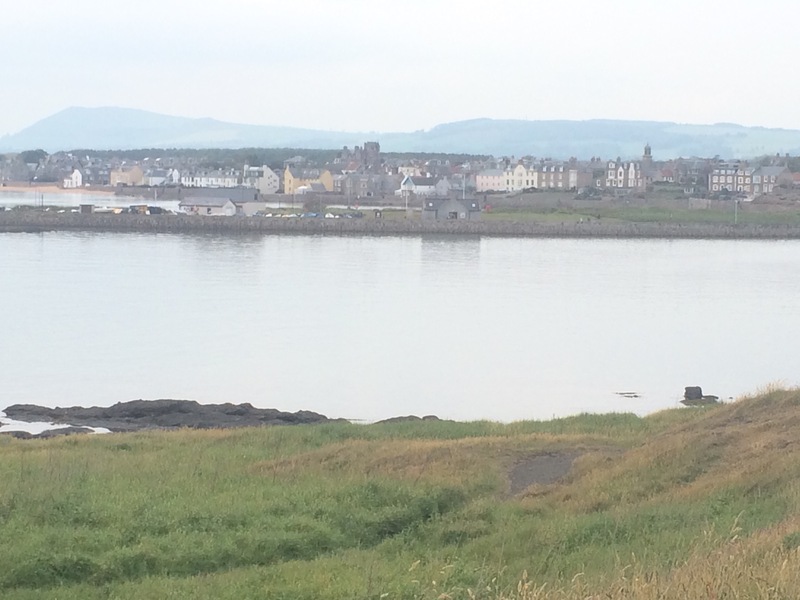 The annoying Angus Coast Path, with its poor signs and poor paths (or no paths) was not helping. This was a shame because had Seaton Cliffs been anywhere else they would have been magnificent, but here, today they just had to be walked. If you can peer over the sandstone cliffs there are some obvious caves and inlets that would be great to explore by sea, and I did see a couple of sea kayakers. 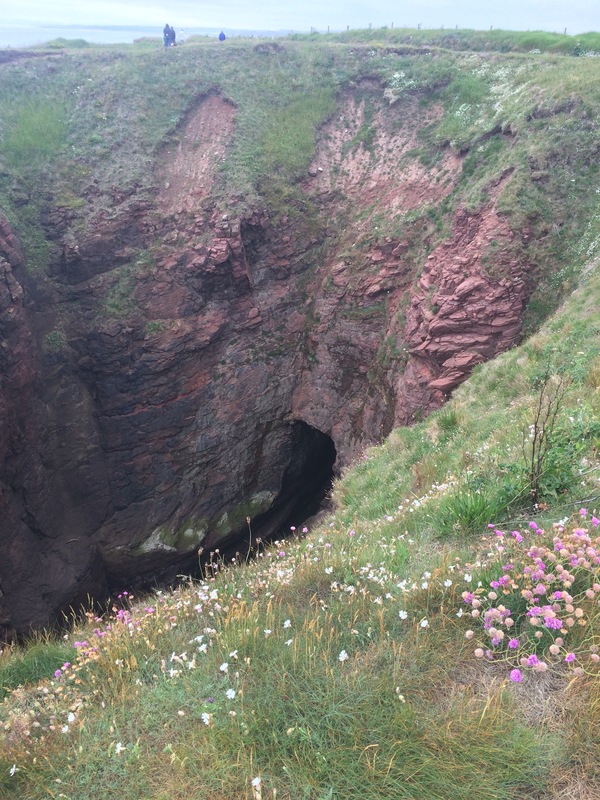 I could also smell and hear plenty of sea birds nesting on the cliffs. There were plenty o gulls and occasionally I saw fulmars, razorbills and cormorants. 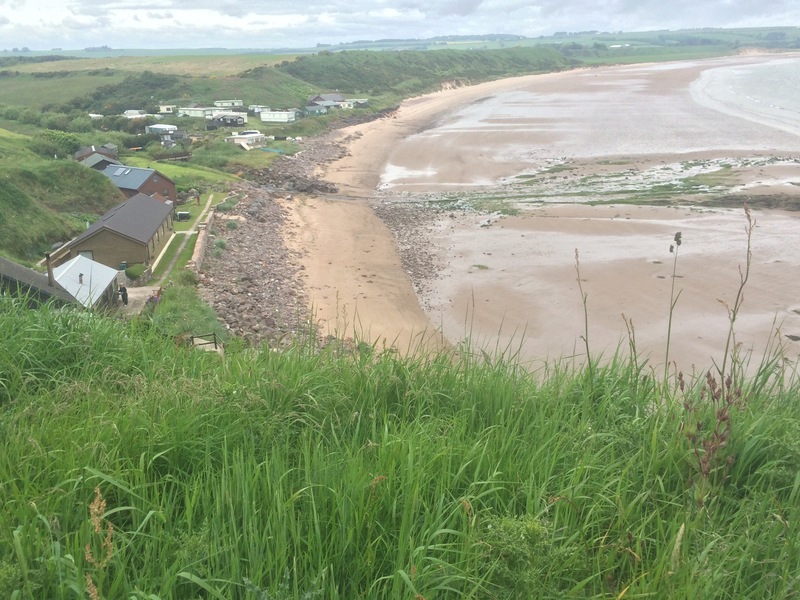 I walked through the small village of Auchmithie and the path to Lunan Bay took me slightly inland on farm tracks and skirting a few crop fields. 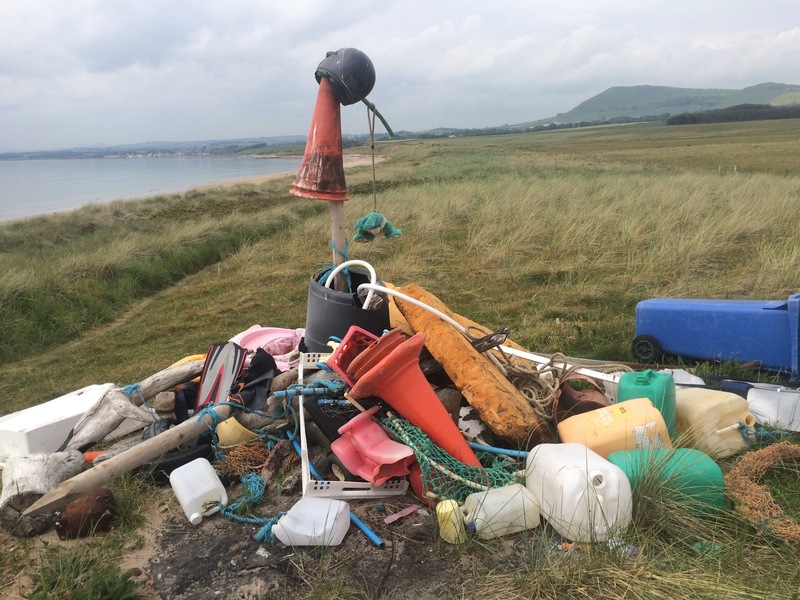 I reached the Bay at the Southern end where a few shacks and caravans made up the tiny settlement of Corbie Knowe and had a great view along the beach before I walked it. It was beautiful and there was no one here on this huge expanse of beach in summer. Halfway along the beach Lunan Water flows out into the sea and so I had to detour inland and over a road bridge at Lunan Village. I had a quick chat with a man who I’d just watched drive his tractor around the sand; he owned the main house by the beach (and the beach as well). He uses the tractor to pull in the salmon nets laid out in the bay. 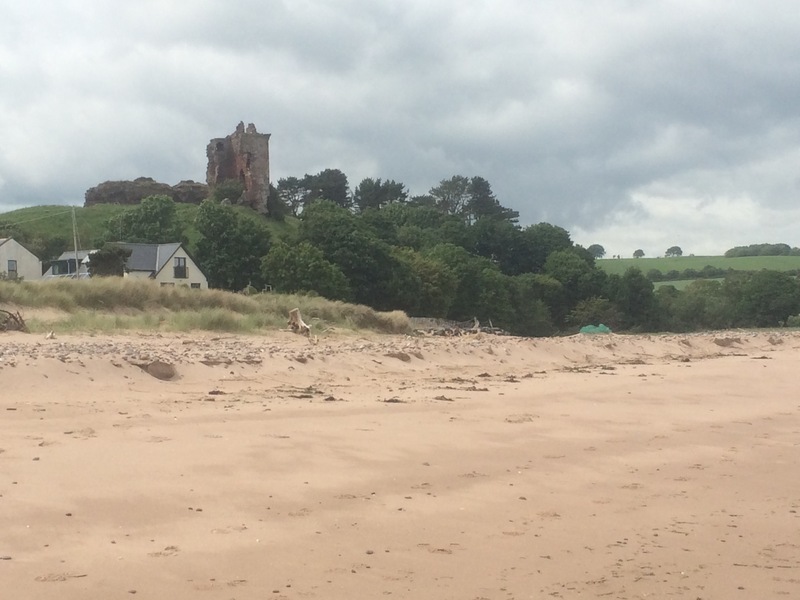 He directed me up a path around Red Castle into Lunan and confirmed that I couldn’t walk to Montrose any other way than following the cycle way along the roads. Armed with that knowledge I walked up the hill to the main road and waited for a bus, just as the sun was coming out. 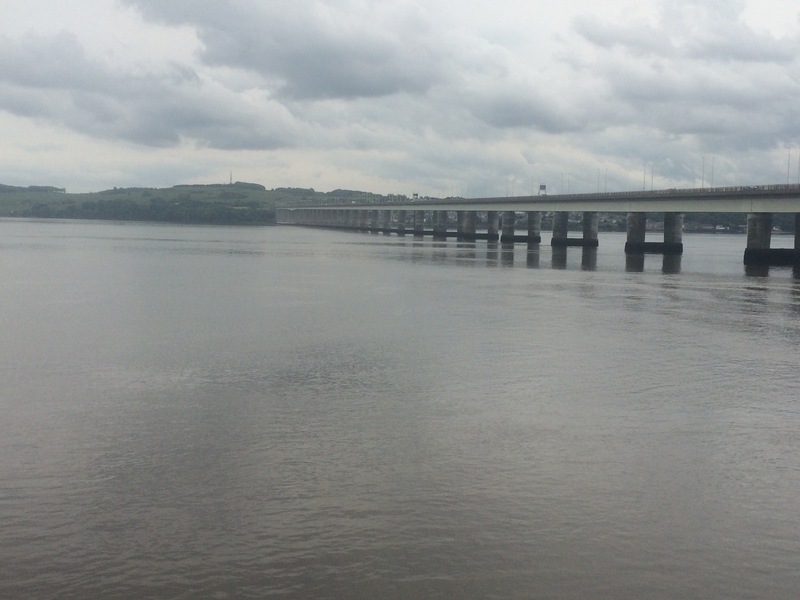 I caught the bus along the A92 and across the bridge that spans the River South Esk and the Montrose Basin. Montrose is a large town and was the first busy place I’d seen. I didn’t spend long here as I still had to reach St Cyrus further along Montrose Bay. 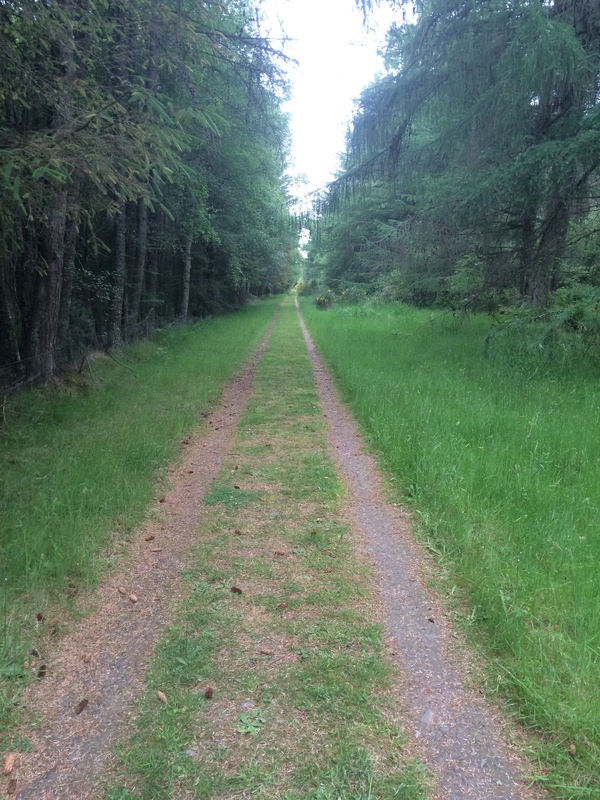 I followed yet another cycle track along a disused railway line that used to take the salmon to London. 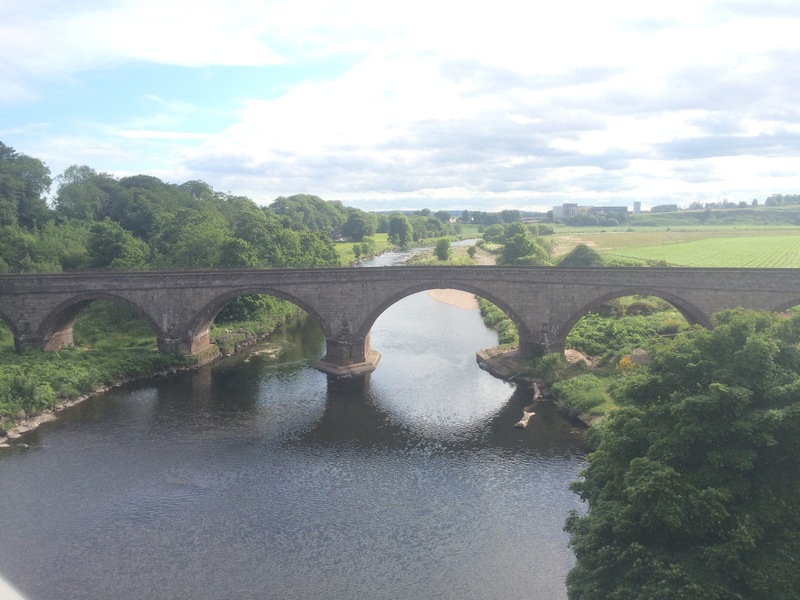 I crossed the viaduct over the River North Esk, which took me out of Angus and into Aberdeenshire. It was here that Sam and Fran picked me up and I got a lift the last 2 miles up the hill to their house. I was treated to a lovely evening of good food and good company. I caught the bus to Dundee and started walking along the cycle route next to the docks. I’d only gone about a mile when I came across a checkpoint and signs telling me it was possible to cycle through the docks (if I had appropriate ID) but walking was not allowed. Disgruntled I was forced onto the main dual carriageway as the only route and so when I spied a bus stop I decided to catch the bus to Broughty Ferry. 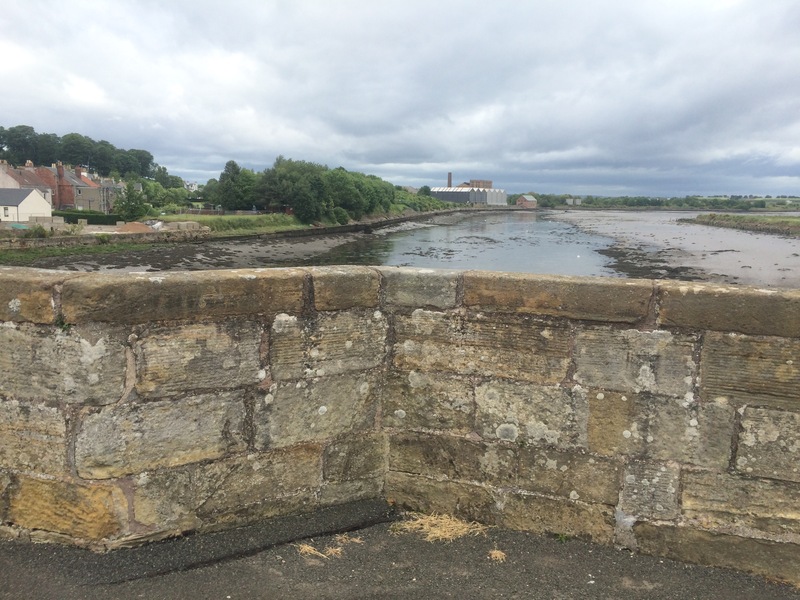 Once in ‘The Ferry’ I stopped at a cafe to cheer myself up and then continued past Broughty Castle and along the cycle route to Monifieth and Carnoustie. Today’s walk was very dull. I spent nearly all day walking along cycle paths next to railway lines and with very little to see. 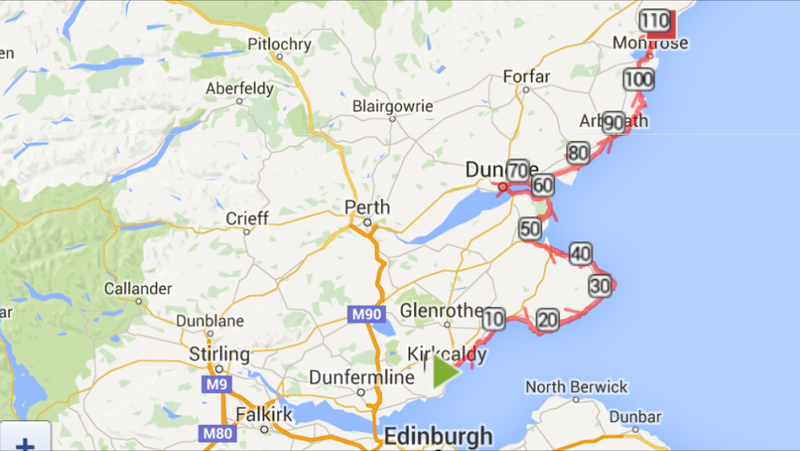 Angus council has not yet provided a tourist route for walkers, only cyclists and drivers. 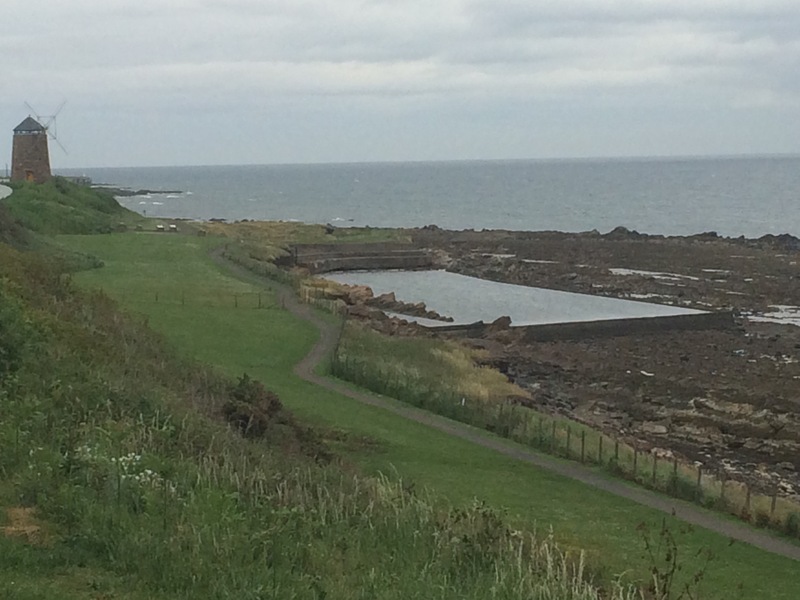 I walked past Barry Buddon rifle ranges that extend out towards Buddon Ness and prevent the public from accessing the coastline. After them it was Carnoustie and the British Amateur Championship was taking place so there were a few people and TV cameras about. I stopped at another cafe in Carnoustie, and to admire the very well kept war memorial, before starting the march to Arbroath. After about 20 minutes I realised that the walk was pointless as I was following the trainline (again) and so I turned around and marched back to Carnoustie and got the train and bus back to Ruth’s. Possibly my most boring day of the trip so far. I caught the bus to St Andrews and was so early I had the town to myself as I wandered around the streets admiring the beautiful buildings, many of which seem to belong to the University. I stopped at the only cafe that was open early and then wandered down to the golf course, which was a lot busier. St Andrews was gearing up for The Open in a few weeks and the golf course was full of players, staff and many contractors putting up stands and things. I hadn’t realised there were actually 6 courses here on this prime spot of land that pokes out into the River Eden estuary. 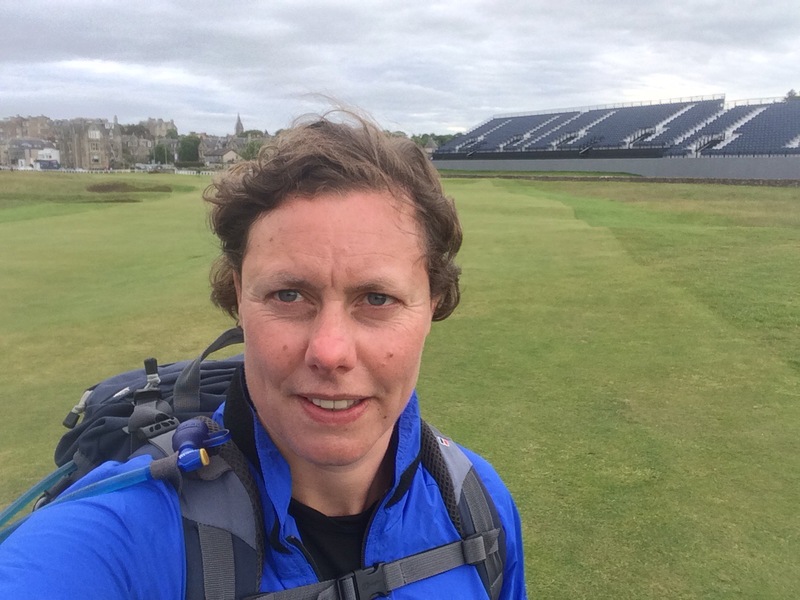 I could probably have walked down the golf courses right to the estuary, but I couldn’t be bothered with all the golf avoidance so I just crossed the 18th in front of the stands (I think women are allowed here now) and made my way past the big hotel and onto the cycle path to Guardbridge. The cycle path unfortunately went closer to the main road than the estuary so there was nothing to see until I could cross the river at Guardbridge. I walked along the road past the rundown old papermill and through Leuchars village, past the old RAF base. From here it was into Tentsmuir Forest, which occupies the corner that comes round into the Firth of Tay. It was a long walk through the trees and there was no one about. Then all of a sudden I was in a clearing and there were picnic tables and a van selling crepes (still no people). Amazing. Naturally I felt obliged to stop for some lunch, which included a Nutella and banana crepe. Yum. I did venture it of the forest onto Tentsmuir Sands, but the walking was easier on the forest tracks as it was quite windy. I passed an old ice house that had been used to keep ice for packing fish for transportation. 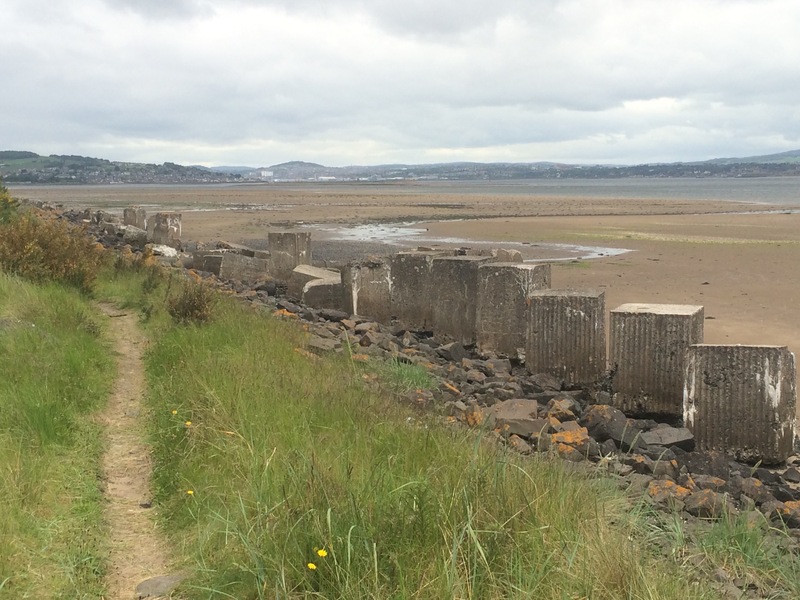 Coming out of the forest at Tayport there were good views across the Tay to Dundee and Broughty Ferry. Yet more cycle tracks to reach the Tay Bridge and from there I caught the bus back to Wormit. Two buses back to St Monans and I started with a walk down the hill that the town is built on to the small harbour. 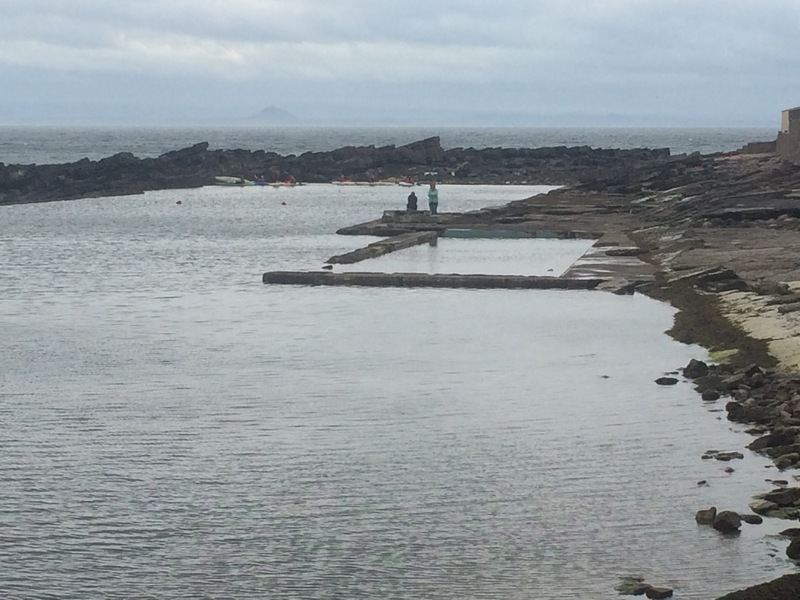 St Monans, and all of the towns today, had a tidal swimming pool built into the rocks. It used to be the site of salt pans in the 1600s and these are still visible, along with the windmill above them. Unfortunately it seemed that none of these pools were any longer subject to upkeep by the council which is a shame. 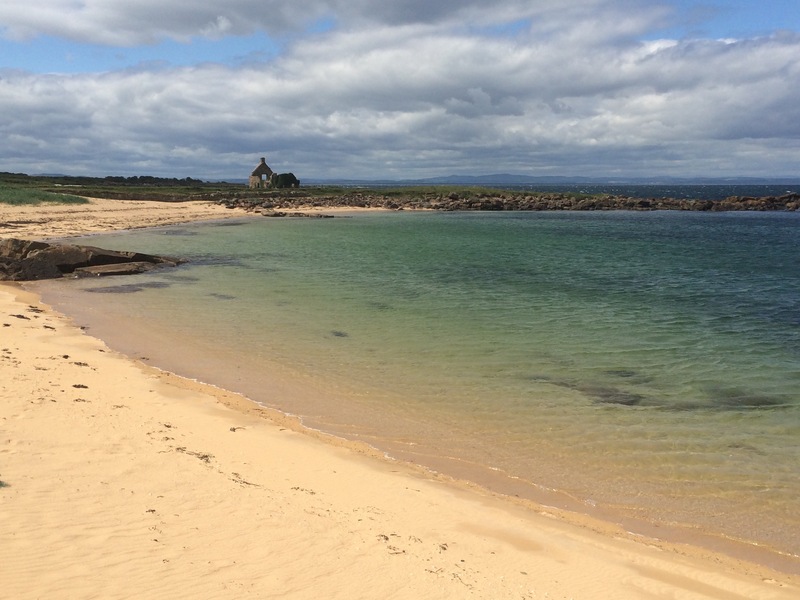 Anstruther’s pool was at least being used by local school children who were having a kayaking lesson. I chatted to one of the instructors who told me to look out for a 250 million year old fossilised tree on the rocky shoreline but although I searched I couldn’t find it. It was like looking for a needle in a haystack among the millions of rocks. The coastal walk today was mostly on cliff tops between towns and it was a very pleasant and beautiful, but hilly, walk. 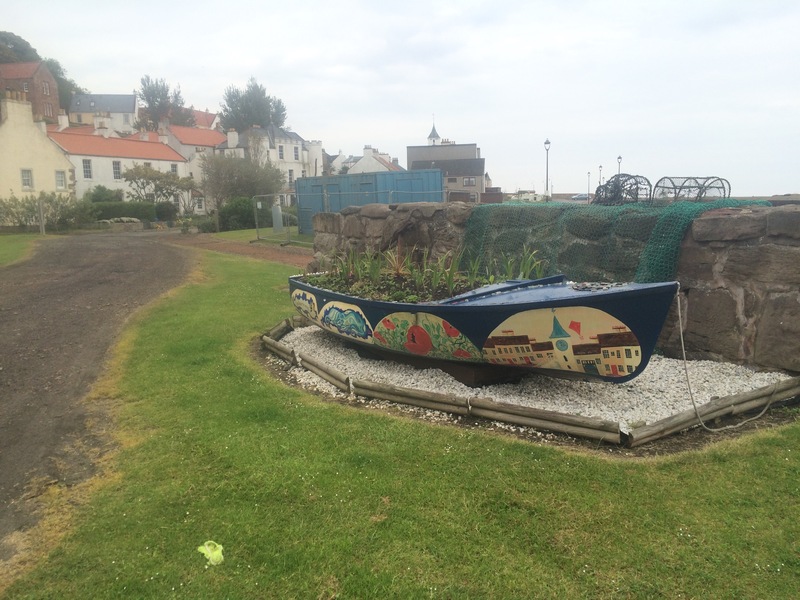 Pittenweem was the next town and then Anstruther. 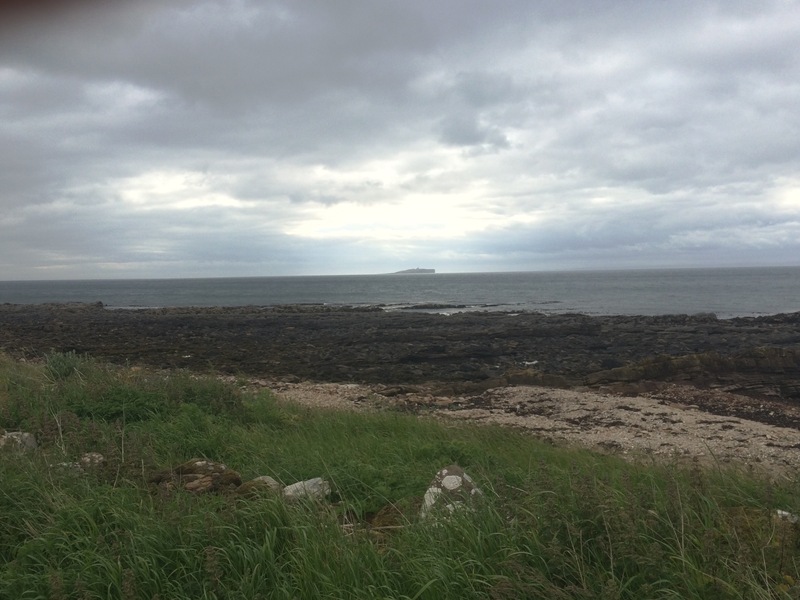 The sky was cloudy but at one point there seemed to be a halo of sunshine over the Isle of May, which is just off the coast here and can be visited on a boat trip from Anstruther. 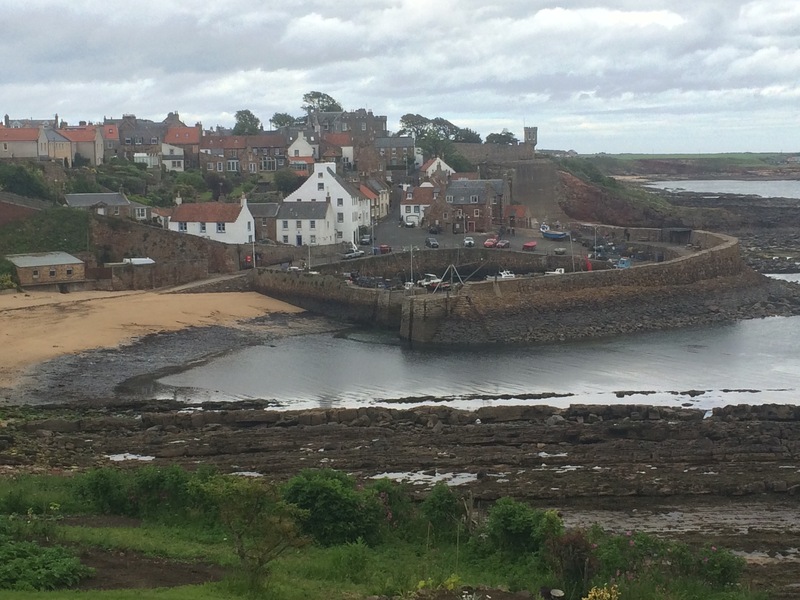 Crail is the next picturesque little harbour town and I stopped here for a well-earned cream tea. 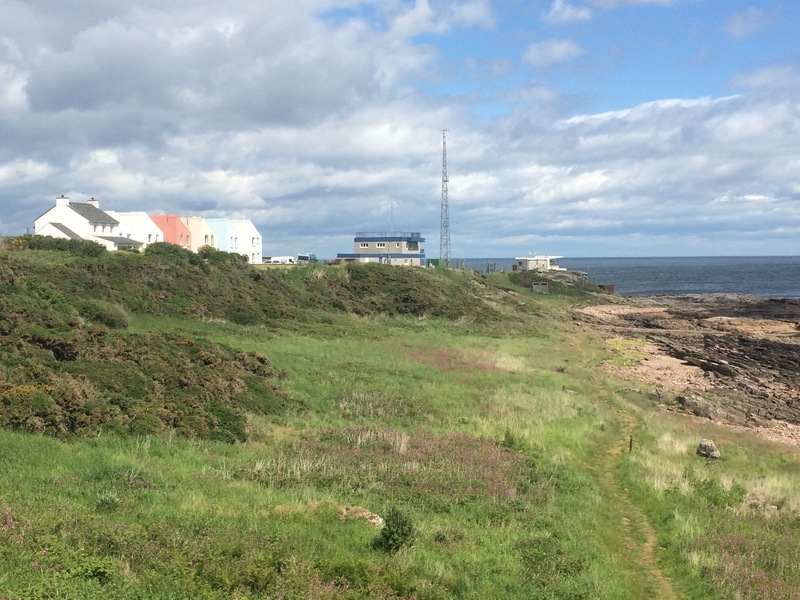 From Crail I headed past a disused airfield to Fife Ness. Rounding Fife Ness meant finally leaving the Forth behind and looking ahead to the Tay, it felt like I was getting somewhere. The scenery was stunning and it helped that the sun was coming out. I had reached another golf course, a posh one where there seemed to be more caddies than players and I definitely heard American accents. It didn’t prevent me from walking along the edge as the path was quite eroded in places. I was moving between beaches and links golf courses. It was amazing the different colours of sand on the beaches, some were white, one was grey, and some were yellow. 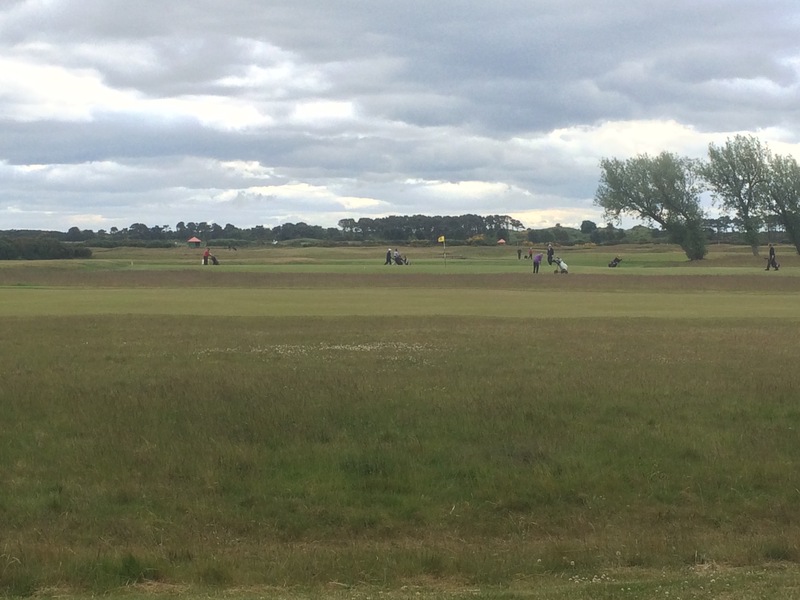 I thought Cambo Sands at Kingsbarns was particularly beautiful. After walking up the small valley and crossing Kenly Water at Boarhills the path became a lot more rugged for the walk to St Andrews. There were lots of ups and downs and a few places where the path seemed to have been eroded away and a bit of scrambling was required. It was sweaty walking but fun in the sunshine. 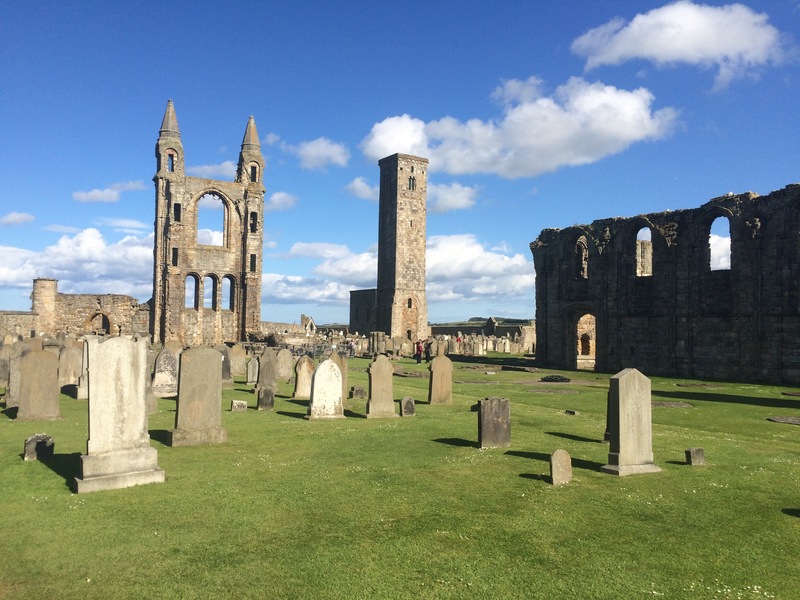 It had been another long day and I arrived at St Andrews just in time to have a quick look around the cathedral ruins before they closed. After that I rewarded myself with an icecream from the gelateria and then had just enough time to shop for some food before the last, and only, bus back to Ruth’s. A lovely day. I was up early to catch a bus to Leuchars and train to Kirkcaldy, where I promptly bought a coffee to set me on my way. 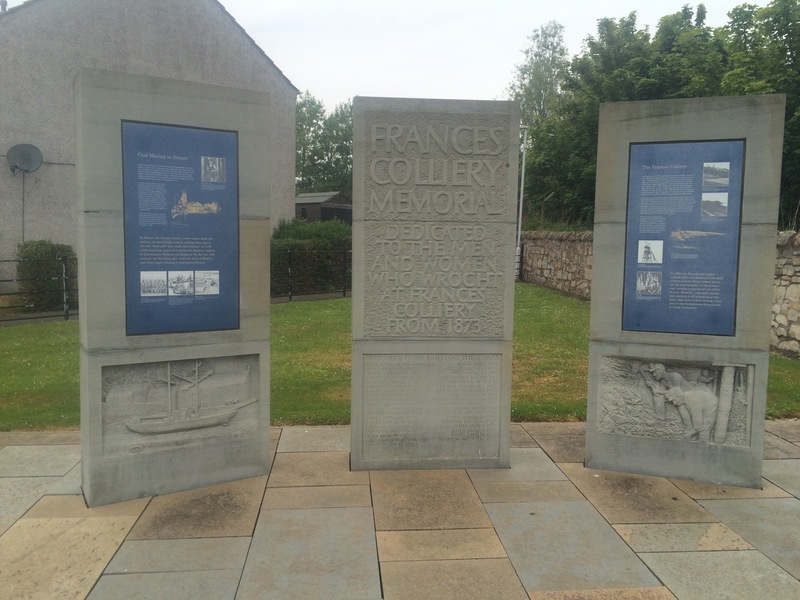 Not much to note about Kirkcaldy, although there were a few plaques dotted about as a reminder that it was here that Robert Nairn designed and manufactured linoleum floor tiles. Not the most exciting claim to fame. 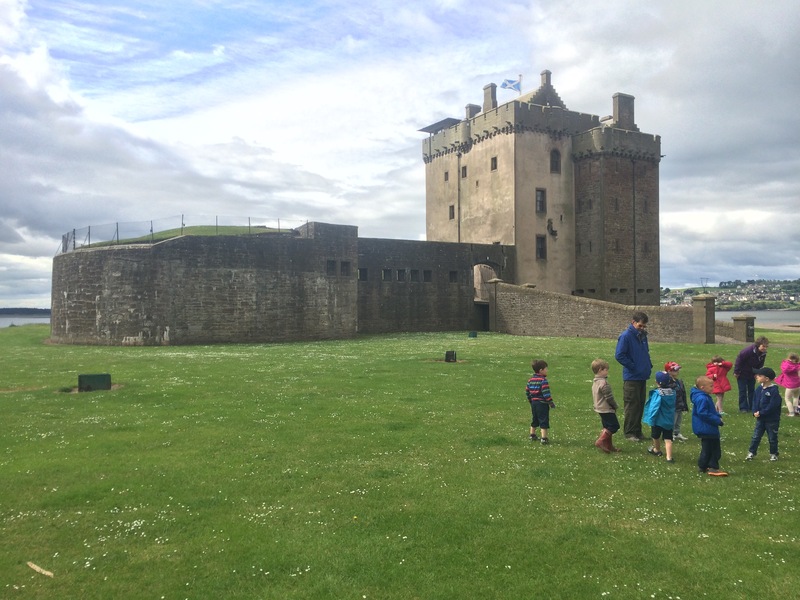 I headed through Ravenscraig Park and into Dysart, an old coal mining town with a small harbour once owned by a rich man who built a big wall around his property to keep the peasants out. Nice. 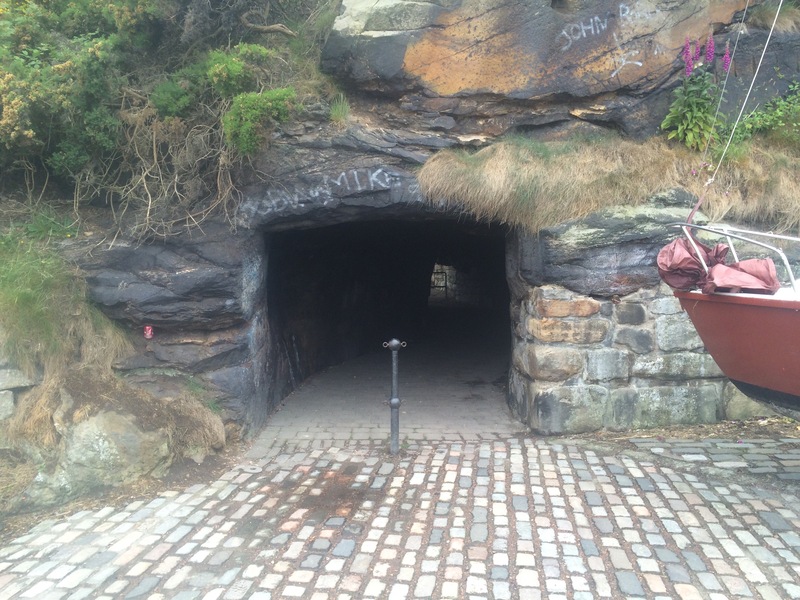 The path goes through the tunnel he created in the rock for a rail line to reach the harbour. 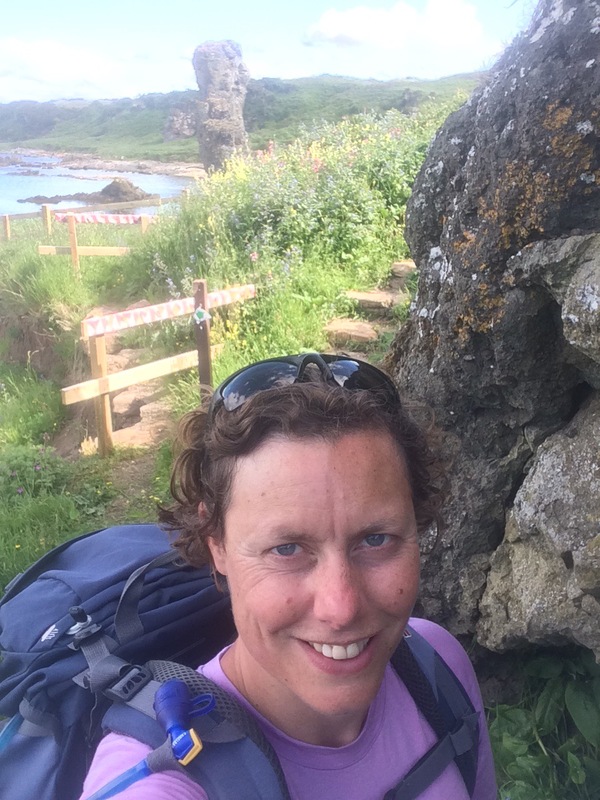 The next stretch involved a few ups and downs as the path alternated between shore and woodland with sandstone cliffs starting to appear. 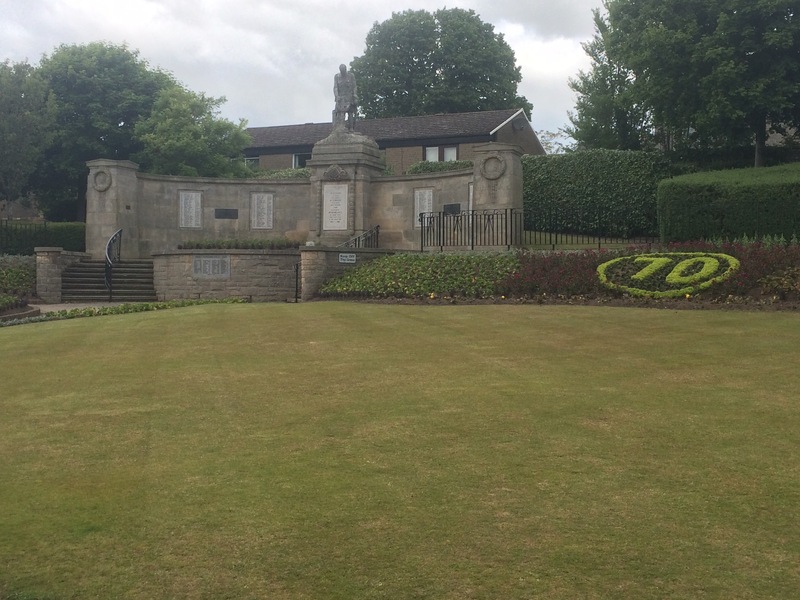 West Wemyss is a pretty town purpose built for workers on the Wemyss Estate. 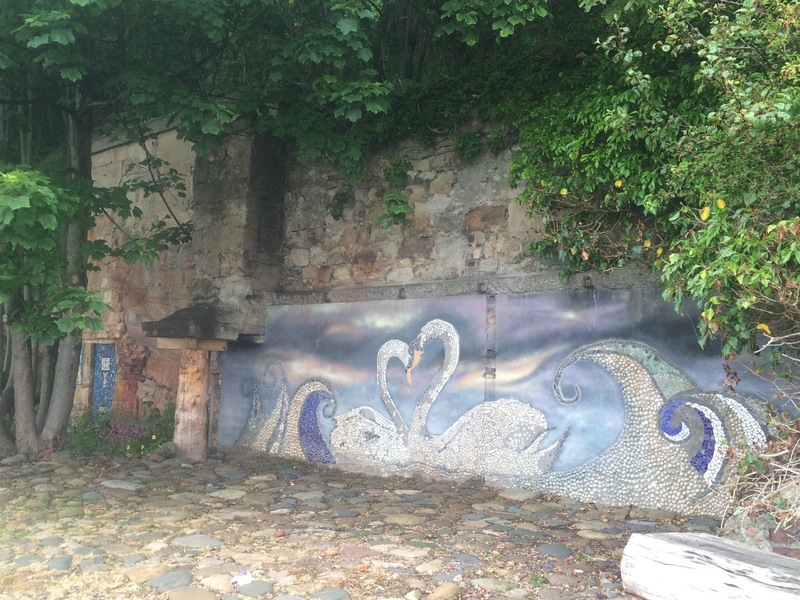 It has some lovely art work on the sandstone cliff. 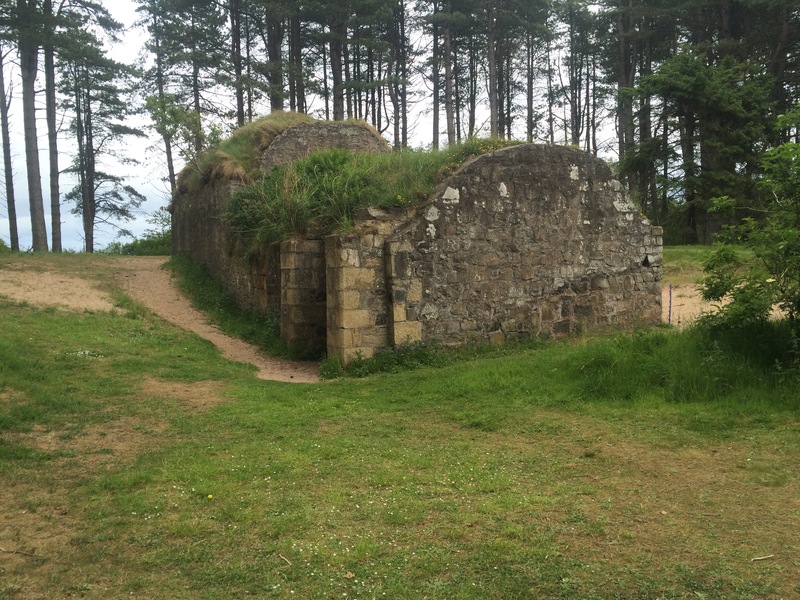 I walked along the shore, beneath Wemyss Castle, past Coaltown of Wemyss and into East Wemyss. 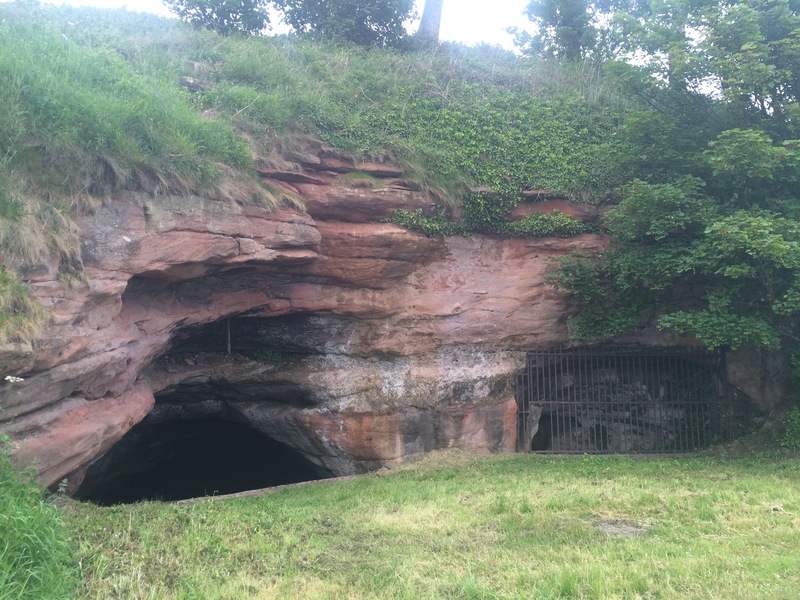 This was also once a mining community and is the site of several caves containing artwork from our distant ancestors. The cave I looked in had lots of danger signs, brick columns propping it up, was full of rubbish and sporting some artwork that looked a lot more recent than the information board had suggested! I reached Buckhaven and immediately walked past a bakery; I felt compelled to try its fare. I can highly recommend Stuart’s Bakery, which is purportedly the world champion scotch pie maker and UK sausage champion! I ate neither, but their rhubarb pie is amazing, so good I had to go back for an apple tart as well. Feeling refreshed I headed through the town to Leven and Largo Bay. I had a choice of walking on the beach or the footpath through the dunes by the side of the golf course (the first of many for the next 3 days). I always assumed that a links golf course was just a course by the sea, but I have learned that “links” refers to the type of soil and terrain (coastal sand dunes) that is particularly suited to golf. Well I never. 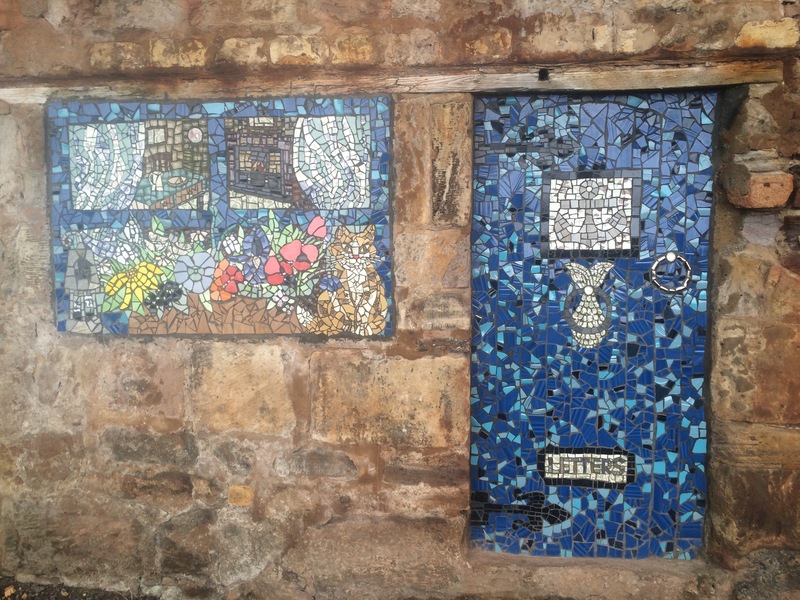 Lower Largo is a pretty little town whose cottages reminded me of Robin Hood’s Bay, which is probably why lots of the windows had holiday home signs in them. The walking was fairly easy as Fife council has mostly done a good job signposting the Fife Coastal Path. The views across the Forth were through a haar (mist) so the hills around Edinburgh were a mixture of blues and greys. 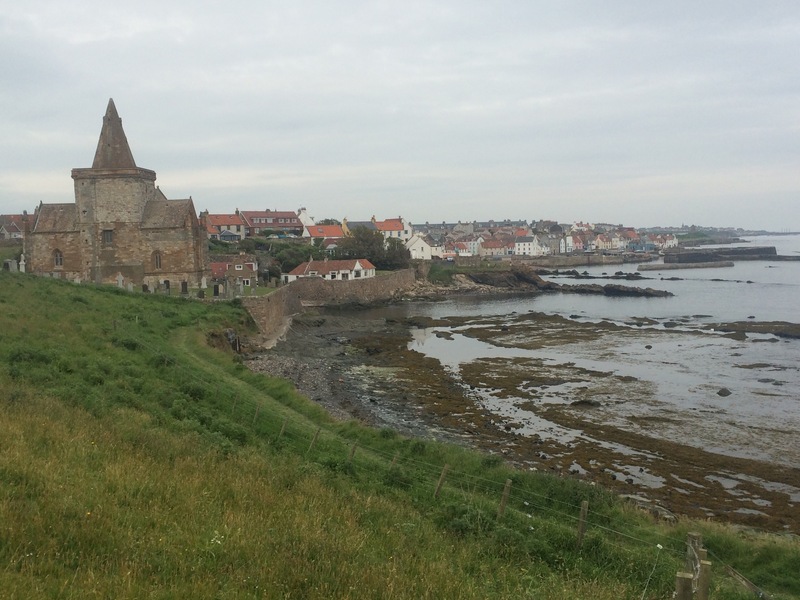 I arrived at Earlsferry and this was the first town of the area known as East Neuk of Fife that stretches around the corner of Fife to St Andrews. I found these towns to be quite picturesque and quiet; lovely places to live I thought. Earlsferry in particular had some rather large houses backing into the beach and the sea at Chapel Ness looked very inviting for a swim on a muggy day. But there were other people about and I didn’t have my swimming costume with me so I resisted the temptation to strip off and dive in. 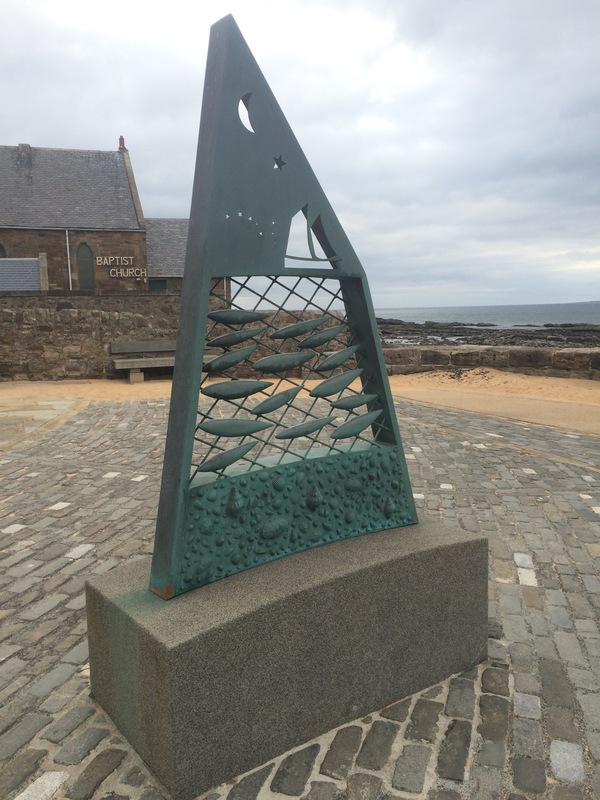 I walked through Earlsferry, Elie and on to St Monans, where I caught 2 buses back to Ruth’s house. It had been a long day but the sun had come out in the afternoon and the scenery improved as I went along. I left Shetland on the Sunday evening ferry and, after 12 hours of mostly lying down trying not to let the motion of the boat make me feel sick, I arrived at Aberdeen at 7 am. 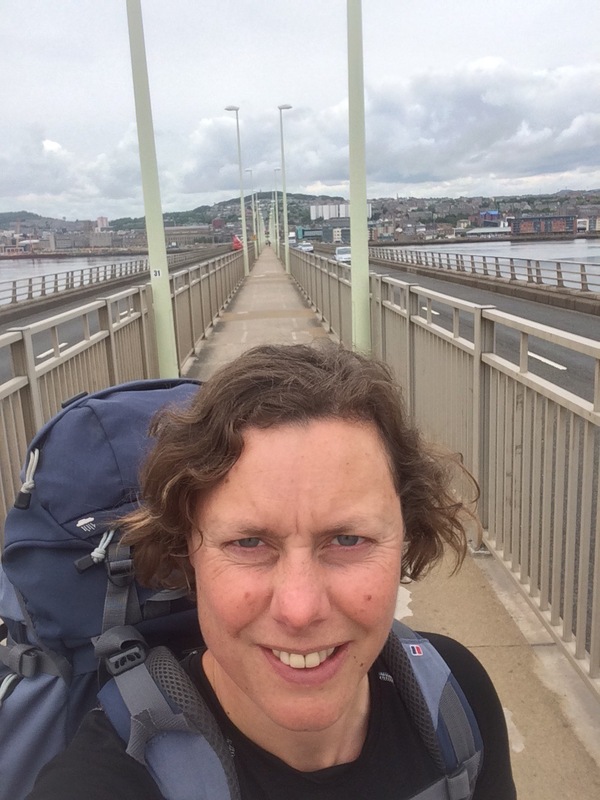 I caught the train from Aberdeen to Dundee and then walked over the Tay Bridge and back into the Kingdom of Fife. Unusually, pedestrians walk down the middle of the bridge with the traffic lanes either side. Not sure it’s my favourite design! 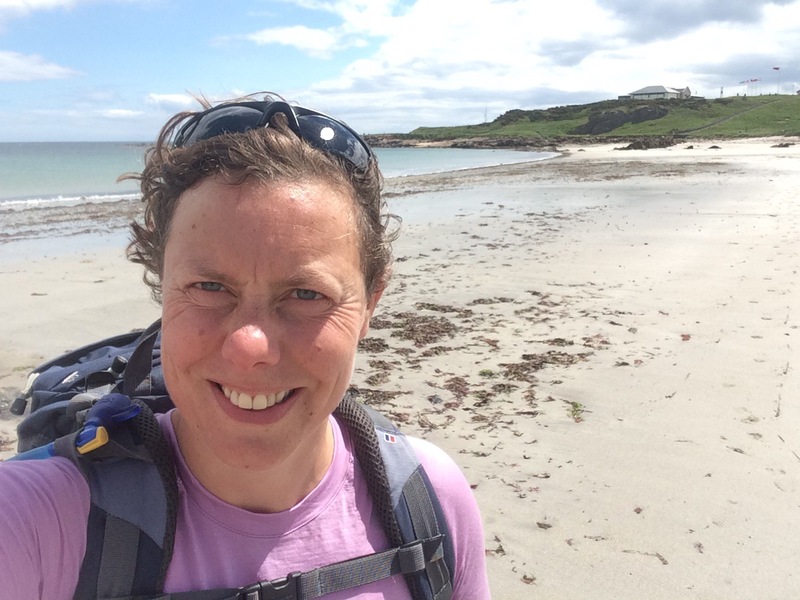 My friend Ruth had kindly offered me the use of his house so I can hopefully walk “light” for a few days around the Fife coast. Although not technically a walking day I still covered 5 miles of coastline and then a further 3 walking to and from the shops. I also managed to get a haircut. And all this while still feeling the motion of the boat; I must have looked drunk as I felt like I was swaying more than walking!